Self proclaimed to be “America’s Mo st Perfect Village”, Cooperstown, New York really is. Great golf and lodging, a beverage trail, museums and a shimmering lake with lots of maples in the background to color the fall, make a perfect vacation spot. Cooperstown is where the Boys of Summer become men of destiny by being enshrined into the National Baseball Hall of Fame. Abner Double Day invented the sport here in 1839 and his namesake field holds frequent games and concerts, with “SugarLand” performing Labor Day weekend. Sports and gift shops abound downtown where you can find the cards your mom threw away. There is an old saying, “If you are lucky enough to be on the lake, you are lucky enough”. Nicknamed Glimmerglass for a reflective shimmer, Otsego Lake forms the mouth of the “Mighty Susquehanna” that empties into the Chesapeake Bay some 444 miles to the south. Take a guided boat tour along the 9 mile shoreline or a sailing lesson. Rent a boat or swim for free. To feel really lucky, stay at the regal Otesaga Resort Hotel, located at the south end of the lake, just a walk or trolley ride to everywhere downtown. Sit on the veranda of this century old, federal styled building with its massive white columns and watch the boats sail by as you dine, enjoy tea or simply rock away life’s burdens in the row of rocking chairs. 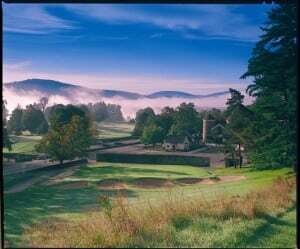 Serve as the peanut gallery while golfers are tested on one of the most challenging finishing holes of the must play Leatherstocking Golf Course. 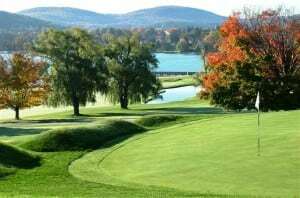 Many of the well manicured holes at Leatherstocking have water views. On the third tee box, a horse and wagon plodded down the road to the Farmers Museum on the left where there is always a country fair and a blacksmith demonstrating the trade. 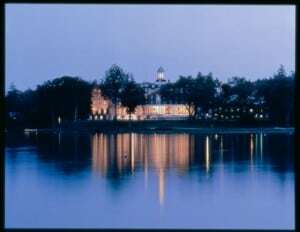 The right side view is that of the country club on the lake’s shore with sailing and tennis lessons in progress. Number 12’s par 3 requires an accurate shot from a dramatic cliff. Though steep, if the wind is in your face, use the posted yardage for club selection. The Fenimore Art Museum, presenting American Art, is adjacent to several holes. Number 16 is a tricky par 4 with a stream crossing the fairway, oozing into an inlet of the lake, full of lily pads that must be cleared on the next long par 3. Successfully pling the cup and set off for the longest cart bridge ride over waterway and along the coast, building excitement for that pretty finishing hole observed by guests. The target green on 18 is lakeside on a hill with a bunker behind to guard some errant shots from rolling into the drink. ard cider and a nice variety of fruit wines from across New York which is second to California in wine production. Proceed on the trail to Bear Pond Winery or one of the breweries. The region was covered in hops before a blight wiped them out, so at Brewery Ommegang, the hops are now imported to brew Belgian ales the same way monks and farmers did over 400 years ago. An invitation to their backyard concert featuring 4-time Grammy® award winner, Lyle Lovett and his Large Band, set our trip in motion. Under a late night cloudy sky, Lyle said, “I’m looking at my band and can see their breath. In Texas we call that winter.” A duet ensued of “Baby, it’s cold outside.” Northeasterners call it fabulous fall and whether you are a sports fan, history buff, nature, music or arts lover, Cooperstown has it all.